The Claret Dibbler can be used as a bushy bob fly on the top dropper for loch style short lining. It tends to pull far more browns than rainbows, especially as you dribble it across the surface, creating a wake up to the boat. Thread : Danville's claret 6/0. Tail : Golden pheasant tippets, dyed purple. Rib : White rainbow ice crystal. Hackle : Natural grey-brown neck or back partridge hackle with a dyed deep claret partridge hackle in front. 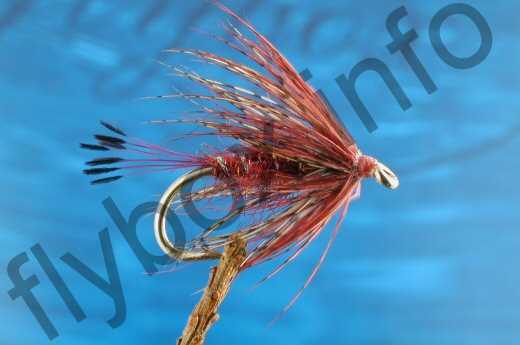 Currently there are no comments about the Claret Dibbler fly pattern from other fly fishermen yet.